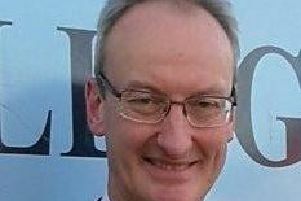 The Rev Colin Harris has said he is ‘looking forward to developing the ministry’ at Scarva Street Presbyterian Church, as he takes up the role of new minister there. A service for Rev Harris will be held on Friday night (January 29) when he will be installed by the Iveagh Presbytery. “The Scarva Street elders approached me about the post and I felt a great peace in responding to that potential call,” said Rev Harris. “I was then invited along to preach in December. Of his call, Rev Harris said he hopes to encourage the church in its efforts to be engaged in the neighbourhood. “I’m looking forward to developing the ministry within the congregation and being involved in the community. “Scarva Street is a church that very much wants to be involved in the community and there are already a number of projects in place. “It is a church that wants to make a difference where they are and be a welcoming church,” he added. The Rev Harris is married to Cathy and they have two children. Anna aged 12 is at Banbridge Academy, and Cameron, nine, attends Edenderry Primary. The new post means they will soon both be able to walk to school. It was when he was studying for a degree in civil engineering that Rev Harris felt a call to the ministry. “I was working with young folk in my home congregation at Duncairn, when the elders spoke to me about going into full-time ministry. Rev Harris is leaving his present congregations in Richhill and Tandragee. “During my time at Ahorey and Clare we developed a ministry there and folk have been lovely. They are great folk to minister among - very faithful and kind, especially about my decision to leave. Rev Harris will preach his first service at Scarva Street on Sunday, January 31.